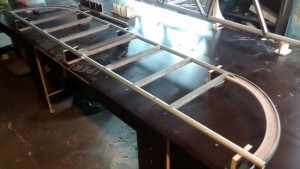 We have finished the structural assembly of horizontal stabilizer for the Goat glider. 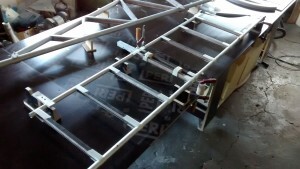 Horizontal stabilizer is composed of two parallel 1 inch OD tubes connected by 8 parallel ribs and 2 circular stabilizer tip ribs. With these tip ribs we replace the original bent tip tubes to keep the same profile thickness along the entire span and increase stiffness. Next is to assemble the elevator.